I thought I would show what we're doing with school these days. Ellie is in second grade and Isaac is in PreK. I have a spare bedroom this year to use for school, so that helps a lot with keeping my sanity intact. 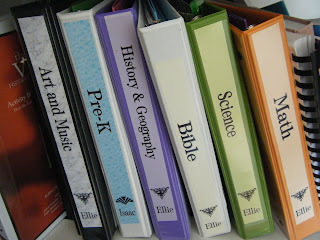 I organized subject notebooks with folders, subject matter, extra papers, pockets with pencils, glue sticks and erasers (in case we take things outside). Isaac has just one notebook. 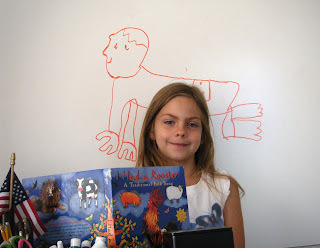 Ellie's Reading, Grammar and Writing notebook was in use when this picture was taken. 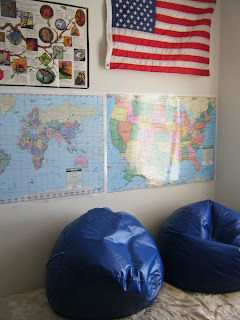 I had lots of idea helps from reading homeschooler blogs this year. I really like this idea. 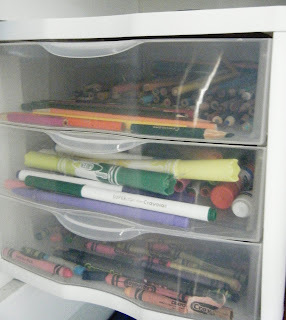 Drawers for coloring supplies. We just pull out a drawer when it's needed. Colored pencils, markers, and crayons. It's all ready to go and always in the exact same place. No more hunting for boxes or bins, and the kids are less inclined to make off with them. Here's our reading area. After switching bedrooms around we ended up with an extra mattress so plopped it on the floor, threw a couple of beanbag chairs on it and we have a comfy spot for reading. I freely admit that I am the one who was looking for more reading comfort, since at this stage, there is a lot of reading done by Mom. 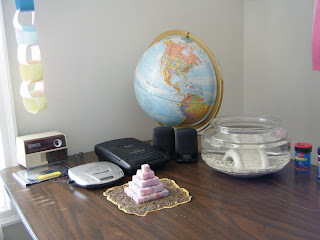 This is one end of the table we work at, complete with a recent pyramid project from our study of ancient Egypt. I never dreamed they would be so helpful. I used templates generously provided by Donna Young at her wonderful website and made my own. 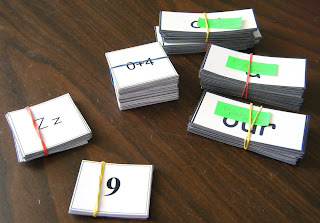 I have alphabet cards with no pictures (which are hard to find) so we can practice sounds along with letters without the picture hints. I have numbers. Isaac can count, but is not yet recognizing some numbers. Ellie has Addition math facts to memorize, and Dolche words, which are words to learn by sight along with phonetics. The Dolche words are separated into different piles right now. Words Ellie has mastered, words she is working on, and words she has not yet started. She really enjoys the "competition" of flash cards. I was surprised at how well they work. Here is our fabulous 4' x 8' whiteboard. We looked at Menards and Home Depot without finding what we needed. Turns out our local building store keeps them in stock to supply the public school. Neat deal. And they are cheap too. 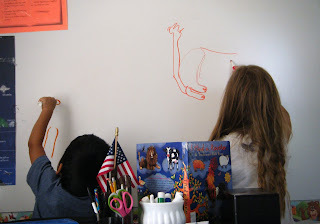 The kids like to do their figuring on the whiteboard. 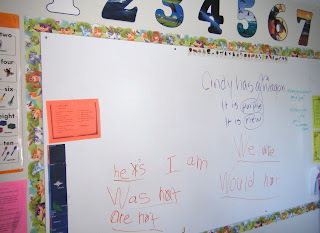 Here Ellie was reviewing part of the day's Grammar lesson. I am really looking forward to improving my own grammar skills while educating my children. Another wonderful benefit of homeschooling. When not doing school, we sometimes play fun games, such as the one suggested in a book. Draw a picture and see how quickly the subject can be guessed. Mom was the guesser. Ellie was very pleased with her baby drawing. Mom guessed it very quickly and then Ellie finished her drawing. 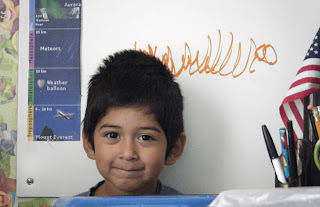 This is Isaac with his caterpillar. Mom guessed that one right too. Here's our classroom mascot. 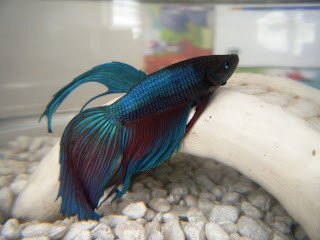 His name is Bubbles. I love your school area! It just looks so fun and inviting!